Place the soda bottle upright in the center of a square piece of cardboard that measures about 2 feet by 2 feet. Secure the bottle in place using the masking tape. Use strips of cardboard to form the mountain by taping one end of a strip to the top of the bottle and the other end to the cardboard base so each strip descends out at an angle. They should overlap to form a sturdy form to support the paper mache. The shape should resemble a volcano. Do not cover the opening of the bottle at the top of the form; you'll need it later for the eruption. Mix up a paper mache paste recipe. Several are available, but a simple mixture of flour and water in a no-cook paste recipe is sufficient. Tear the newspaper into strips about 1- to 2-inches wide. The length can vary according to your project. Saturate one strip of newspaper by dipping it into the paste. Stick the newspaper strip over the form and smooth it with your fingers. Repeat the saturate and paste process with all the newspaper it takes to completely cover the form. The strips should overlap and run in different directions. Leave the opening of the bottle at the top of the volcano uncovered. After one layer of paper strips is applied, wait 24 hours for the paste to dry. Apply a second (or third) layer of paper strips until you achieve the volcano shape you like. Let the project dry for 24 hours after each additional layer of strips and paste. When the newspaper is completely dry, paint the volcano. Choose whatever colors you like and give it as much detail as you want. Use brown or gray for the rocks, green for vegetation and, of course, red for lava flowing from the top. You may like the result of the work you did on the volcano so much that you don't want to make it erupt, but where's the fun in that? Declare an eruption date and gather your crew to view the event. Start off by measuring 1 tablespoon of warm water into the volcano crater (the soda bottle). Add 3 to 4 drops of dishwashing detergent and 3 to 4 drops of red food coloring. Add the baking soda and stir with a narrow utensil or stick. Pour some vinegar into the small, paper cup so the cup is about 1/3 full. 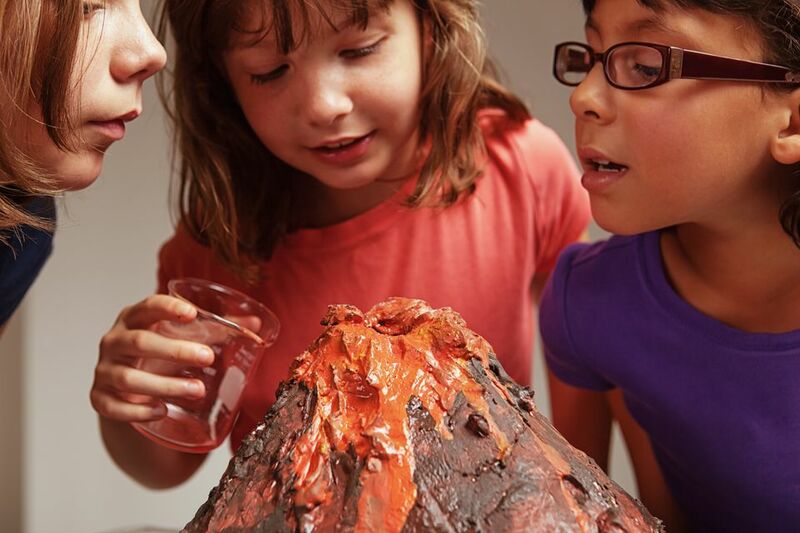 Quickly pour the vinegar into the volcano crater, step back, and watch the volcano's bubbly eruption!